In comparison to a carefully planted and staked traditional herbaceous or perennial border the naturalistic style can look loose and untidy. Your personality will dictate which you prefer – order or chaos. Formal planting with plants arranged at regular intervals and often placed to mirror one another bring instant logic to their surroundings. This must be the easiest style of garden design to get right, but of course, the minute one of the carefully place plants dies your scheme is ruined and all attention focuses on the gap. Personally, I like some elements of formality in a garden’s design to contrast with the informality that I seek to create, but for me a totally formal design quickly looses its fascination no matter how impressive. Through the associations that naturalistic planting invokes it has the ability to engage and enthrall us. It can trigger memories of longed for landscapes that offer escape and relaxation. American gardeners can use prairie plants to recall nostalgic thoughts about the once extensive tall grass prairies of their homeland. For me such plantings recall the countryside I am isolated from having chosen to live in the heart of a city. 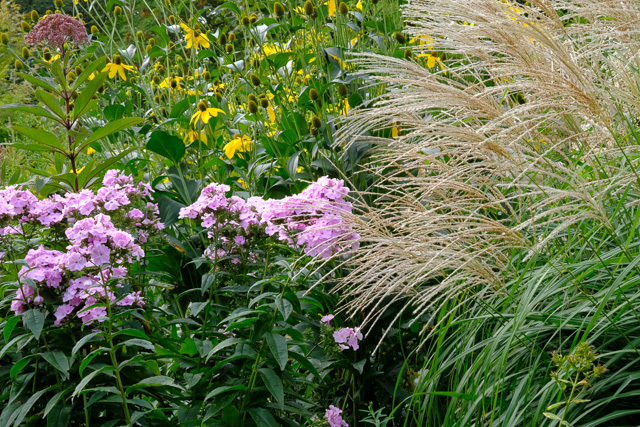 And perennials above all other plants demonstrate the dynamic nature of living things and clearly signal the changing seasons and fluctuations in weather. The biggest problem with naturalistic planting for those of us how want to pursue it is using it within the confines of our domestic gardens. The ideas underpinning this contemporary design trend were first developed in Germany for use in public green spaces. 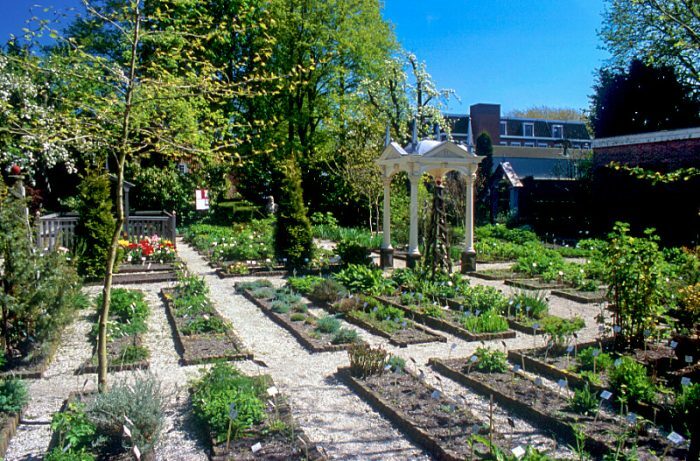 Later adaptions both in Europe and America lead to dramatic schemes for public parks, large private estates and high profile garden exhibitions. These highly publicized projects accompanied by exciting photographs fueled interest and encouraged gardeners to have a go for themselves. Regrettably, few of the projects that followed lived up to peoples expectations and the reasons are really quite simple to identify. 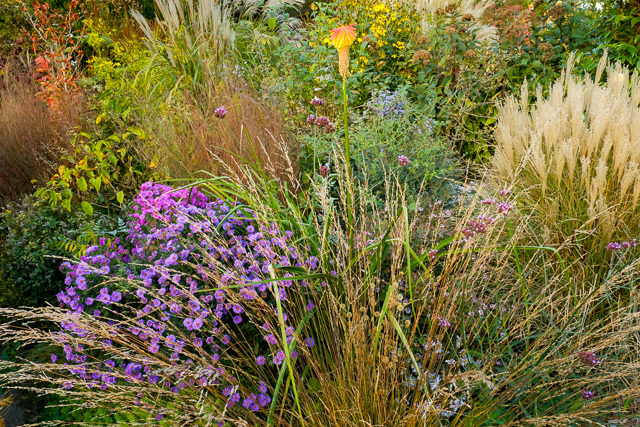 Naturalistic planting needs space to make a bold statement. 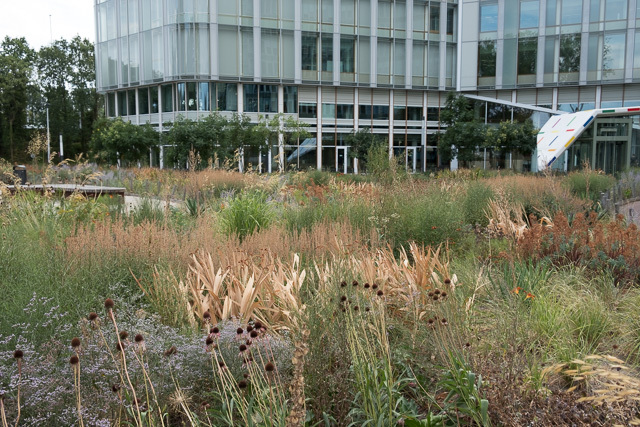 The plants used are repeated across the planting area to emulate natural plant communities. where the same plants reappear randomly to fill the horizon. In a small private garden there is simple too little room for this to work. Further, most landmark schemes were situated in open sunny locations which gave the plants the best opportunity to grow sturdily. 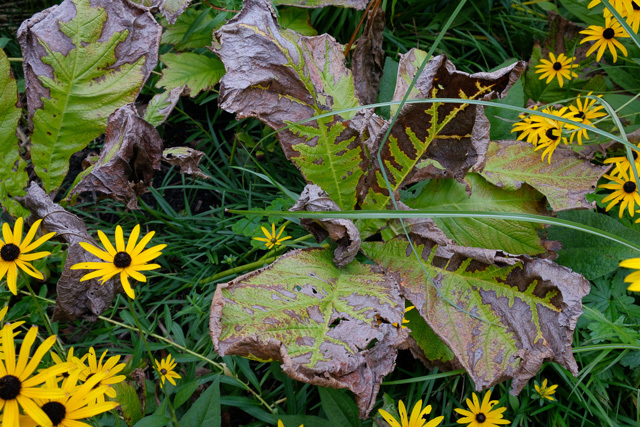 Private gardens in comparison offer shelter, shade and nutrient rich soils – all of which lead to tall, lanky growth resulting in plants collapsing or needing to be staked. My own ideas for the perennial meadows I now design evolved over may years of struggling within the confines of a small, humble garden. The need for repetition of key plants has to lead to compromises and must result in the use of a restricted pallet of plants. I have learned to create schemes using a small range of key plants, but at the same time leaving room for some extra diversity and freedom. 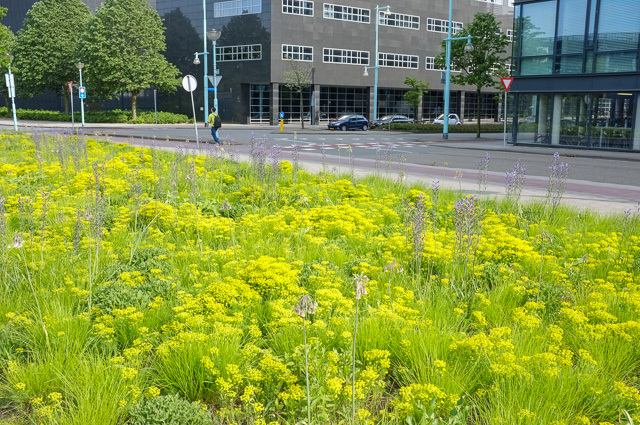 I have also found that by arranging perennial meadows as neat and ordered units within a total garden design that I can introduce some order and formality that is often necessary for gardens that are closely associated with buildings in urban environments. 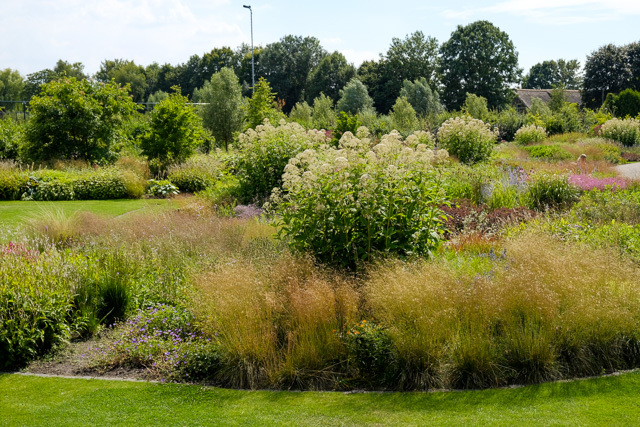 The wide extravagant naturalistic planting schemes you have read about many not be for you, but I hope that the perennial meadow approach will allow more of us to enjoy the benefits of this exiting new trend in planting design. This is a small perennial meadow in my own garden, covering only a few square meters in area but providing colour and interest all year round. Through design and planting a garden acquires a distinctive mood and for this Mind Garden I imagine an informal space through which to wander, relax and feel secure. 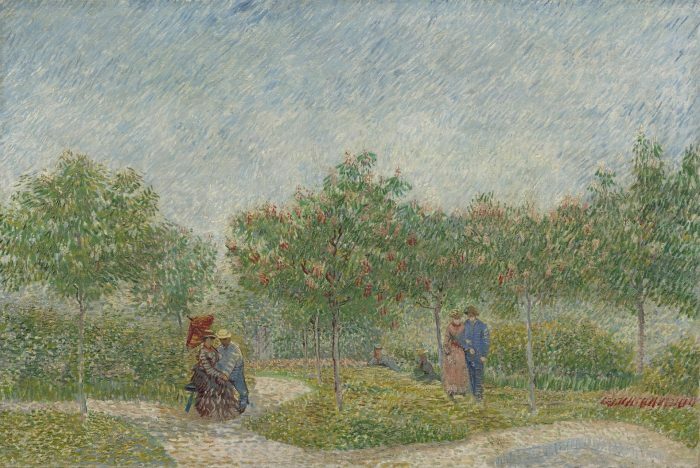 Van Gogh’s garden with lovers is just one of such images that artists have created throughout history illustrating the sort of strolling garden l have in mind. This will be a garden without a focal point, it will surround you with a single sense of place, allowing you to wander focused upon your inner thoughts or the person with whom you are sharing the space. 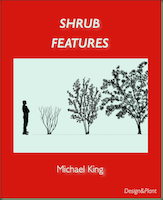 My eBook “Shrub Features” details the idea of surrounding specimen shrubs and trees with appropriate schemes of mixtures of perennials. 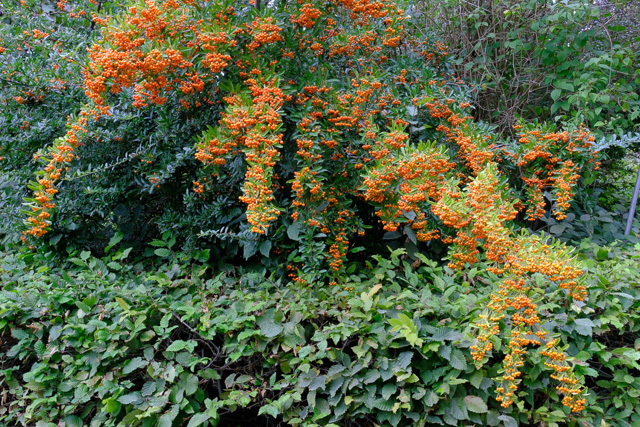 These shrubs stand free from the garden’s boundaries or shrub borders and are thereby presented to their best advantage and allowed to grow naturally. A series of borders featuring widely spaced shrubs and separated by winding paths is the model for this strolling garden. 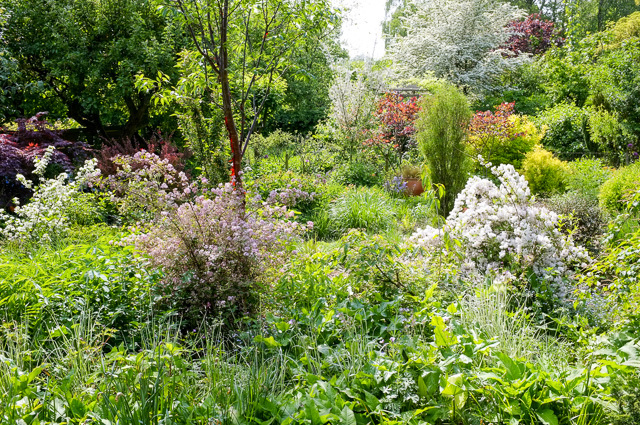 In the smallest of gardens we may be looking at no more than a couple of such shrub feature borders, but ideally this is an idea for a larger garden space with room for a more extensive network of paths with here and there benches to stop, relax and maybe steal a kiss. 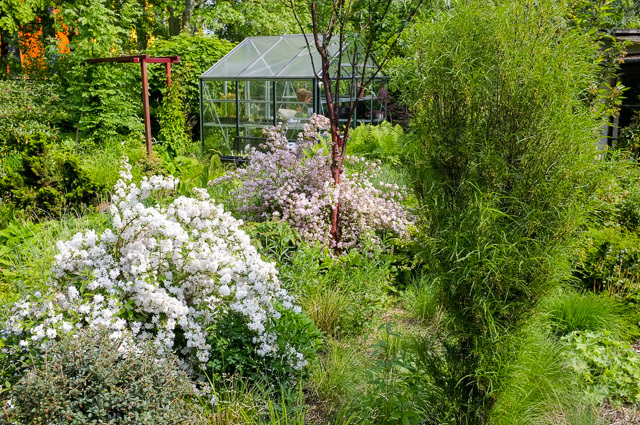 Strolling Garden 50 m. x 50 m.
There are two types of borders: some with small, evergreen Arbutus unedo trees and the others with Hydrangea paniculata shrubs. Each type will have a basic perennial meadow mix covering 75% of the ground area. 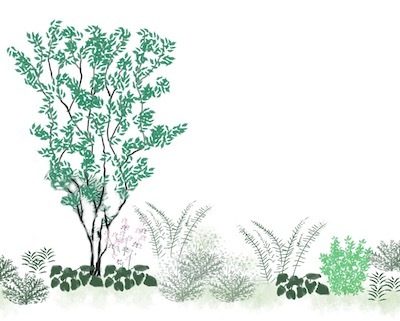 Additionally, up to ten different complementary plants (small shrubs and perennials) will be planted as bold groups randomly throughout the whole garden space; each group being repeated at least twice. Repetition is the key to creating the unified space filling this garden. Arbutus trees are multi-stemmed with flowers and fruit in late summer. The plants surrounding them will reinforce their evergreen character and give the garden its year round impact. 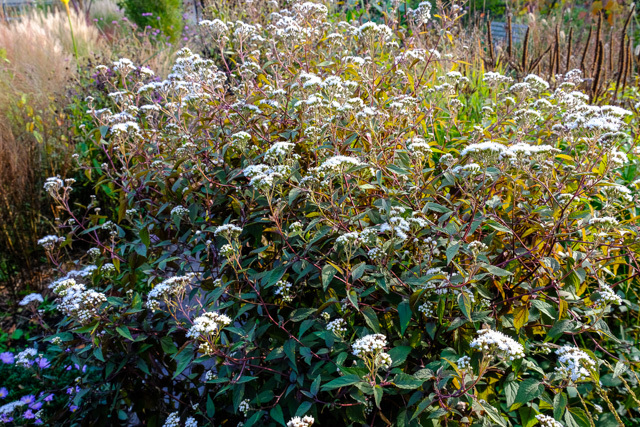 The hydrangeas are wide arching shrubs that flower for a long period in late summer. They will rise above a border dominated by arching green Hakenochloa macra grasses. In winter this grass will turn straw coloured, but remain effective through to the following spring. The repeating clumps of complementary plants add additional interest to the scheme as well as weaving it into an all embracing familiar whole. Strolling through the space the same plants will be seen in ever changing relationships with one another. Feature Border with tree – Arbutus unedo as a multi-stemmed tree and additional evergreen shrubs including Choisia ternata ‘Astec Pearl’, Viburnum utile and Ilex crenata or Buxus will be included here. Feature Border with deciduous shrubs – Hydrangea paniculata and edging clumps of Sarcococca oriental give these borders their structure. Complementary Plants for use throughout the whole garden in groups that will cover approximately 1 m2 each time. Rodgersia podophylla 5 x, Hosta sieboldiana 3 x, Astilbe thunbergii 8 x, Anthriscus sylvestris ‘Ravenswing’ 8 x, Anemone × hybrida ‘Honorine Jobert’ 5 x, Luzula nivea 10 x, Aruncus ‘Horatio’ 3 x, Dryopteris erythrosora (fern) 8 x, Chelone obliqua 8 x. In many ways the actual plants proposed for this Mind Garden are less important than the ways the different groups are being used. The small evergreen tree Arbutus may be difficult for some to find at an adequate size. The trees could just as easily be small deciduous species such as Acer, Sorbus or Prunus and in a larger garden even Betula. 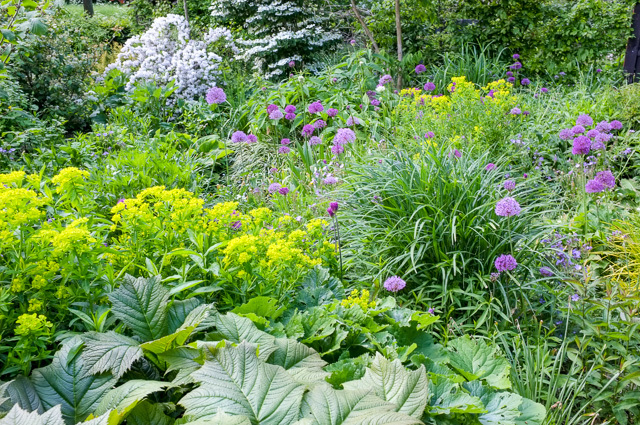 Similarly the perennials need to form a harmonious understory with interesting variations in texture, scale and seasonal flowers. Nothing should dominate and which species are actually used will be dictated by the constraints that apply to all the perennial meadows discussed in this blog. What is important here is the repetition at ground level, mid level and tree level giving this design its strong character. 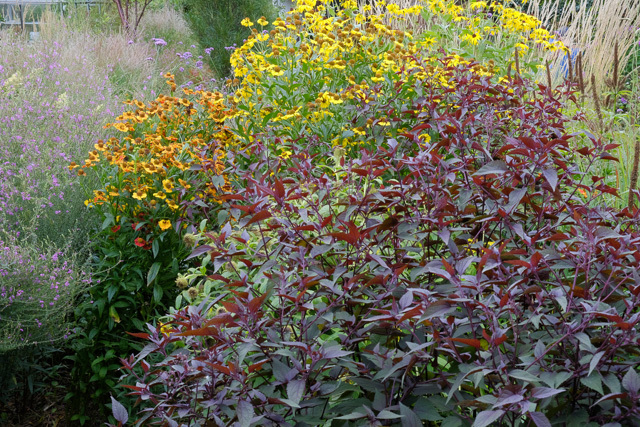 The theme plant schemes are similar to a number included in my eBook on Shady Perennial Meadows. There you will find detailed descriptions of the plants used together with suggestions for a range of different planting schemes. Gardens can evolve over time to reflect the interests and character of their makers and eventually a unique atmosphere will develop. Alternatively, they can be designed either by their owners or a professional designer with the aim of creating a specific mood or visual impact. In this series of posts – Mind Gardens – I will try to show how different ideas and dreams can be realised in the gardens we design and plant. Where do you find a design idea when your garden is nothing more than a square area behind an average house with a view of boundary fences and other similar houses? This is the dilemma of many gardeners who are not fortunate enough to have a garden surrounding an architecturally distinct building or a view across glorious countryside. Many sources spring into my mind, but here I want to look to art for inspiration. 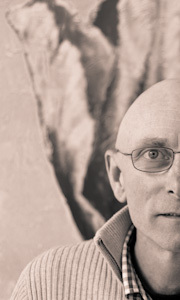 My interest goes towards the work of abstract artists of the early twentieth century; your own interests may differ, but my process will hopefully suggest a way forward. 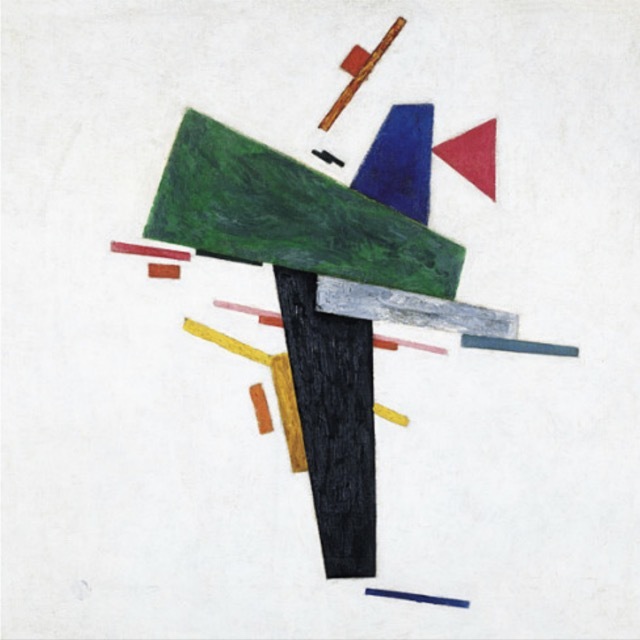 Whenever looking at works by artists such as Mondrian, Kandinsky and Malevich I cannot help myself from seeing designs for the layout of garden landscapes on a range of very different scales. Sometimes the patterns in these paintings suggest border layouts, lines can become paths or hedges and colours identify different planting arrangements. It would be ridiculous to think that you would want to reproduce any of these works using garden components in place of paint and colour, but certain elements can be used to trigger a design process. 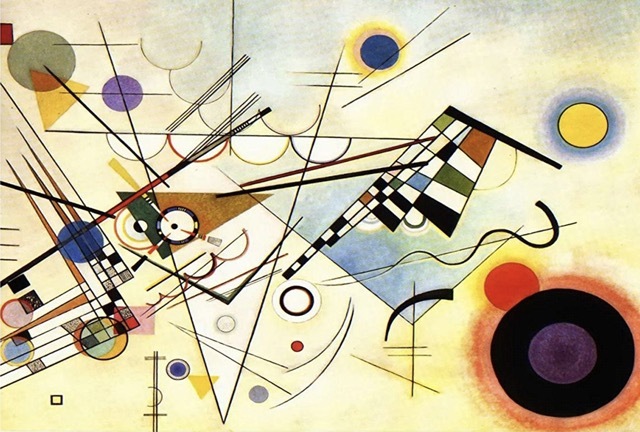 Kandinsky’s early work from the Bauhaus period consist of different coloured shapes linken by straight and curving lines. 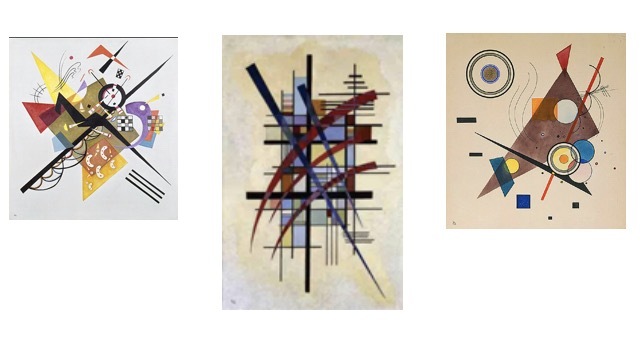 For Kandinsky these works were intellectual expressions of his evolving art philosophy. I am fascinated by their intriguing interrelationships of lines, forms and colours. Taking the distinctive lines, some curved and some straight and tapering, I have attempted to create an abstract planting design in which a central yew (Taxus) hedge cuts across the garden space and changes in height and width along its length. 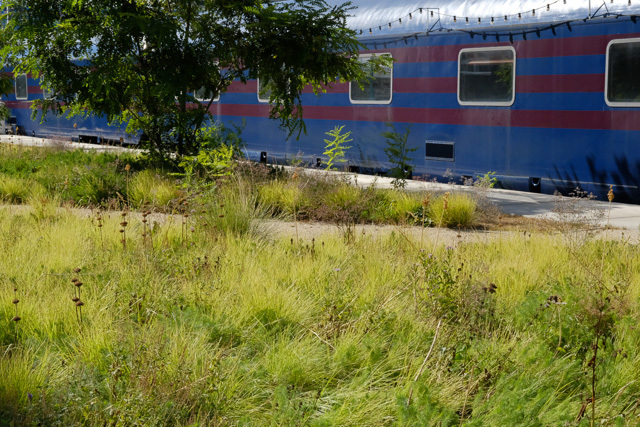 A curving path to the left and a curving line of tall growing grasses further divide the space. 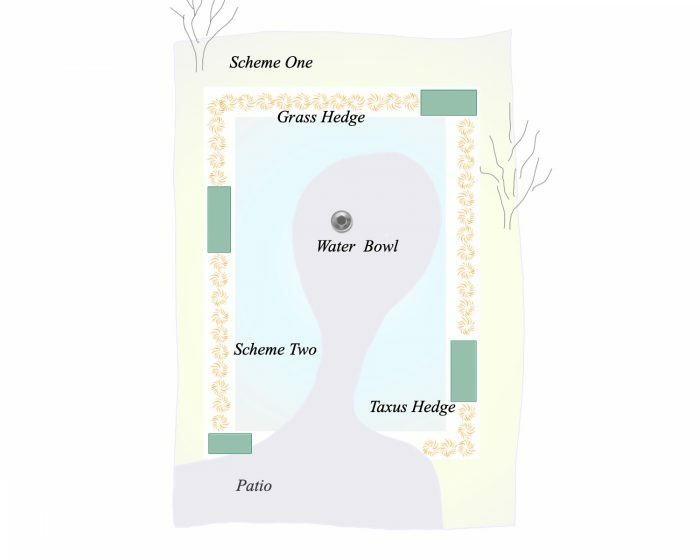 Room has to be created in the pragmatic process of a garden’s design for sitting areas and access and these elements have eventually created a number of separate areas into which I have chosen to drop in three mixed meadow planting schemes taken from my Perennial Meadows eBook series. 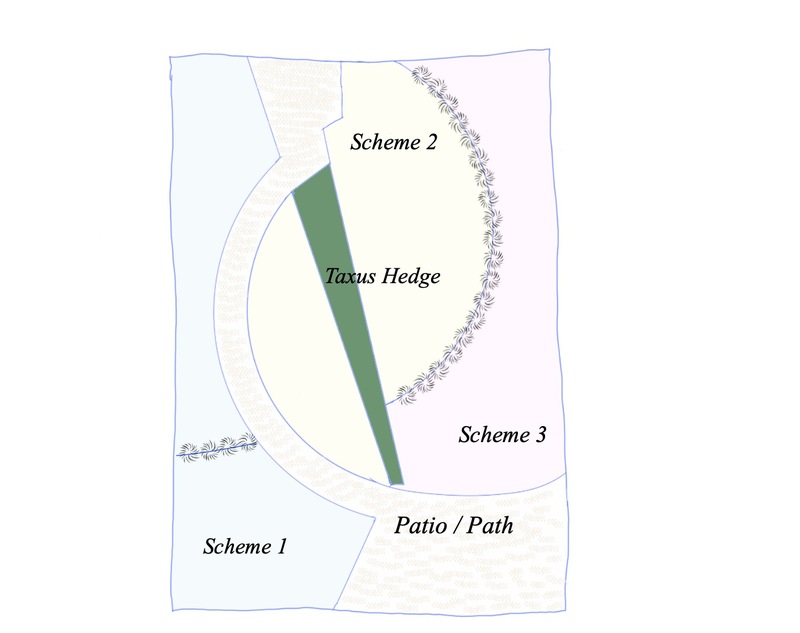 On the right, Scheme 3 is tall and robust and will create a sense of enclosure for the rest of the garden; it lies behind a curving hedge of Miscanthus sinensis ”Ferner Osten’. 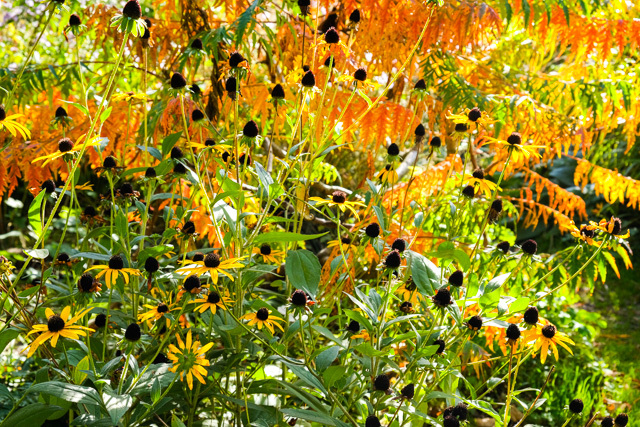 In the centre of the garden a bold mid-height scheme which is dominated by the long flowering period of Rudbeckia fulgida var. daemii is divided in two by the taxus hedge. This hedge will be over 2 meters tall at the rear, dropping to just 90 centimeters near the patio area. Scheme 1 is the lowest-growing of the three with a fresh blue green colour theme and will demand full sun and well drained soil to thrive. To link everything together theme plants from these schemes will be added as complementary plants to the others. 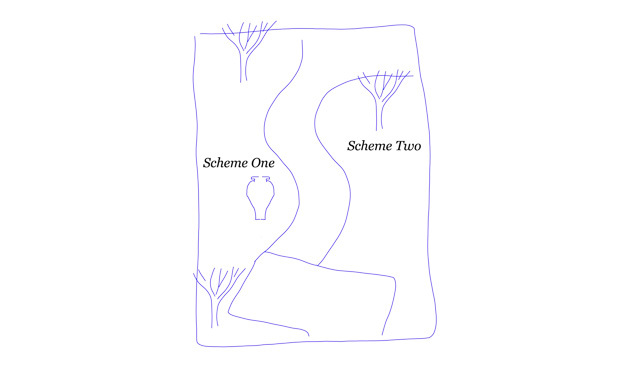 So, for example, the Eupatorium of Scheme 3 will reappear as a bold block inside Scheme 1. Likewise, the Calamagrostis from Scheme 2 will appear here and there in the other two schemes. The advantage of this calamgrostis is that it grows and flowers earlier in the summer than the miscanthus which will eventually dominate the whole garden. Scheme 3 – conceived for this project. 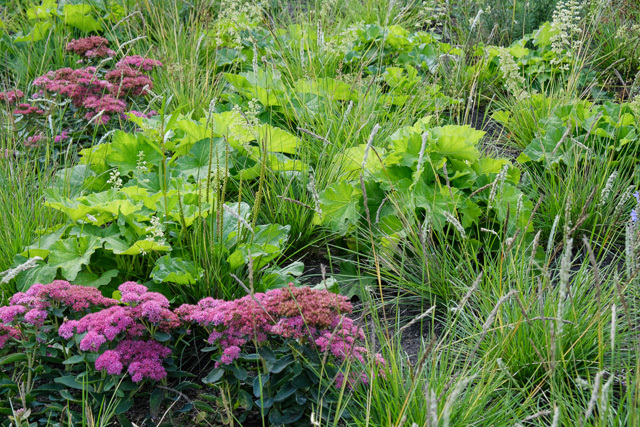 To understand how these planting schemes are put together and function you should read the early posts in the Meadows 101 section of this web site. 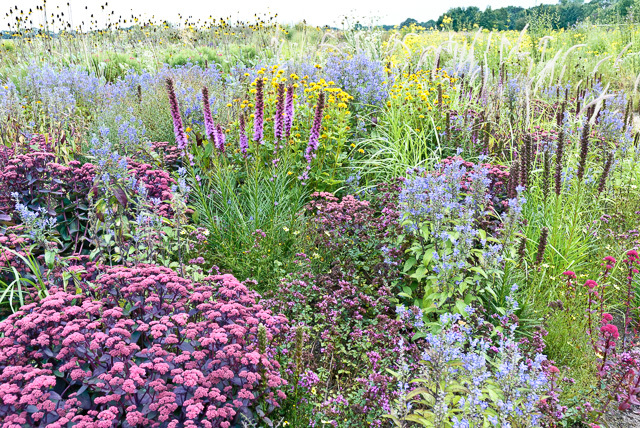 Schemes such as those used here are to be found in the Perennial Meadows eBooks with details of the individual plants used. The garden design presented here could never have been created by simply looking at the site and responding to its setting. By finding inspiration in art (in this case) I have created a ground plan that is both unconventional and exciting to look at. Later in this series of Mind Garden posts I will be looking for other source for inspiration and showing how these can result in a range of very different garden plans and planting schemes. For a garden to be more than just a comfortable place to sit in to drink a cup of coffee there needs to be some sort of idea underpinning its design. Ideas together with constraints guide the design process and can lead to outdoor spaces that have focus, draw attention to something or evoke an emotional reaction through associations. Design ideas need not be complex although gardens expressing thoughts on philosophy, scientific principles and religion are all valid possibilities. Sometimes just the need to provide a setting for a treasured pot or sculpture will be enough, or perhaps the need to draw attention to a distant view. Colours, textures, patterns, smells are all powerful stimuli that trigger associations and can create a sense of place and a mood when incorporated into a design. 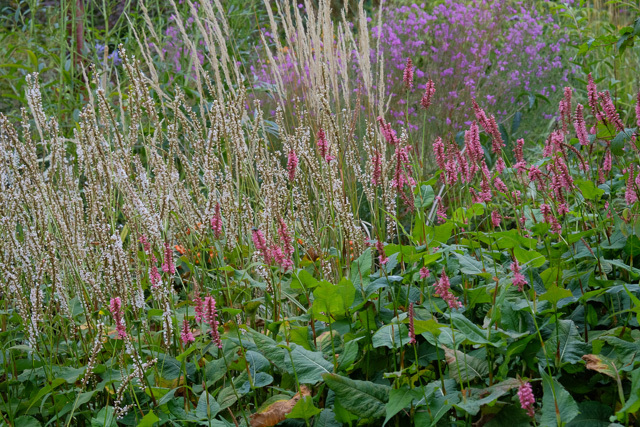 Mind gardens will be an occasional series of posts that will try and show how perennial meadow planting schemes can be used in a range of different designs for small to medium sized gardens. 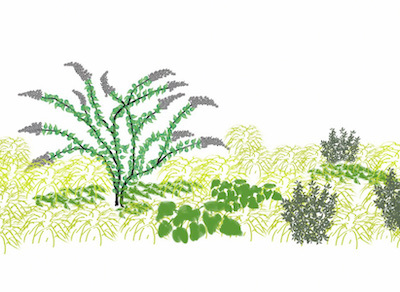 The simple garden plans will show how different garden features, including mixed perennial border plantings, can be arranged in order to express a given design idea. In each case the emphasis will be upon the different perennial plants needed to create the various planting schemes in the gardens.. The actual arrangement of borders, paths, patios together with the siting of trees and shrubs are flexible and would be different for any given real situation, but it is the principals of how best to use perennials in such designs that I aim to cover here. 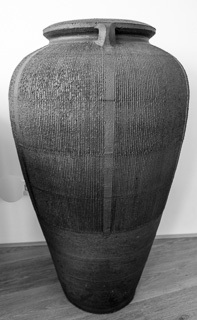 The placement of art objects such as sculptures and large pots in garden landscapes needs careful consideration. Scale is a crucial factor not only of the piece itself, but also of the planting surrounding it. Once, I commissioned a large pot for which I asked the potter to give it extra height in order that it could easily stand out within a planting scheme and not be engulfed by it. My pot will be the focus of this garden design; a rectangular space some 30 meters by 20m, typical of many domestic gardens throughout Europe.. The pot is just over waist heigh and the planting surrounding it should hover around half this. 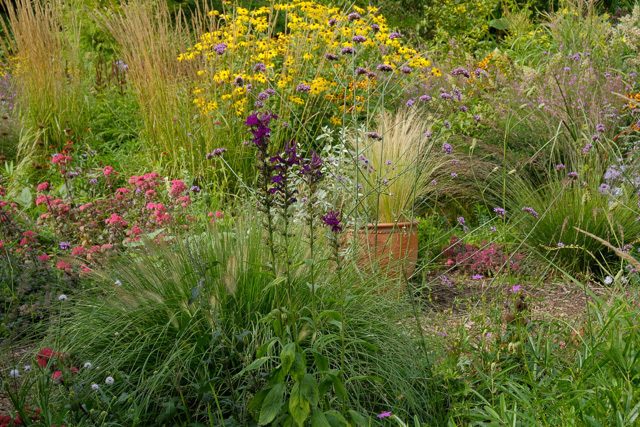 For this important feature I have a simple perennial meadow in mind – Scheme One, in which ornamental grasses dominate; the pot will sit in a wide sweep of these grasses and draw all the attention. Across a path, on the other side of the garden, I have designed a long and deep flower border. 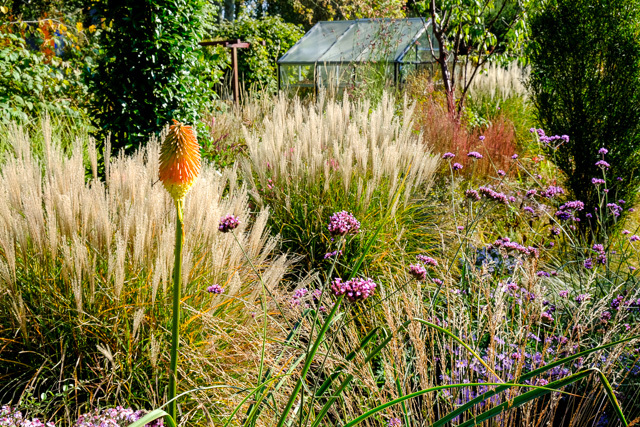 I could just repeat the same grass-based scheme here for a controlled minimalist look, but instead I envisage a low-growing, colourful flower border that will offer more interest over a longer season to the garden owners – Scheme Two. Note: These are often the sort of choices to consider when designing for either a public as opposed to a private garden setting. This plan can be drawn equally well with either straight edged borders or curved and that should be dictated by the setting and your own personal preference. The key design point here is that the large pot stands prominently forward in the border on the left with the grass meadow flowing away behind it into the far reaches of the garden. In late summer when the tussled mounds of Sporobolus grass send up their fine, airy flower spikes the contrast with the hard ceramic vessel will be magical. The small, low-growing geranium will fill in the scheme at ground level and the Stachys sends up neat purple, sausage shaped flowerheads that age to dark brown and will punctuate the scheme long into the winter. Gaura is a short-lived perennial that flowers abundantly all summer. It will fill in this scheme in the early years and may self seed. 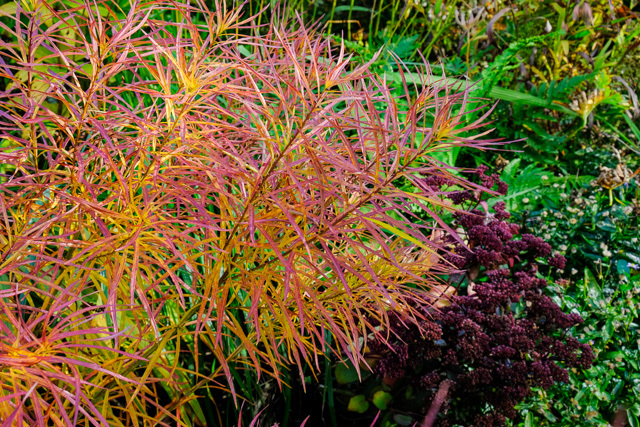 Such a complementary plant is useful here as the Sporobolus grasses are particularly slow to establish and fill out. The blue/grey foliage of the Schizachyrium grasses and the late summer flowering Scutellaria will combine with the purple flower spikes of Salvia nemorosa in early summer which later in the season will stand out as brown seedheads against the rounded mounds of colourful Sedums. 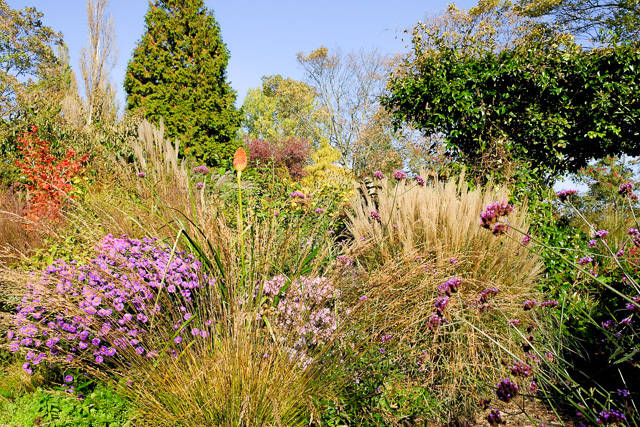 A few extra plants of Stipa orientale here will throw up silvery flower spikes throughout the summer to mimic the wispy, pale coloured flowers of the Gaura on the other side of the garden. Additionally, the Geranium ‘Dilys’ and the Sedum ‘Red Cauli’ introduce additional linking elements between these two schemes. These schemes relate closely with similar schemes detailed in my Perennial Meadows eBooks, in particular the titles Open and Prairie. 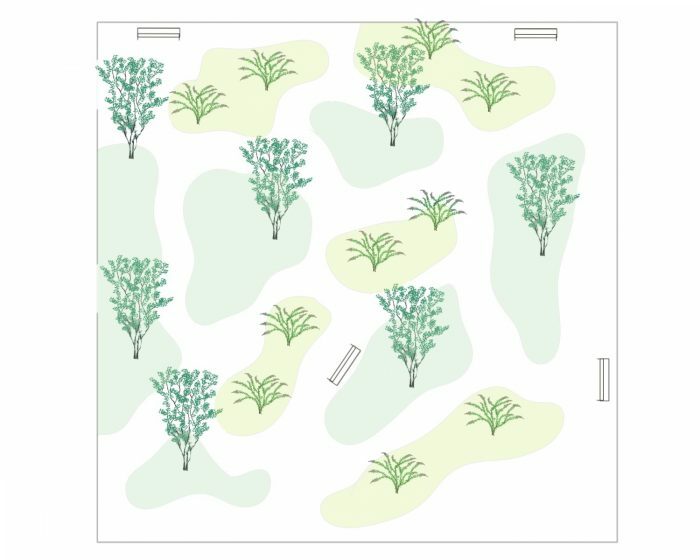 There you will find more detail about the plants used with images whilst also learning how they relate to the other plants being used in those schemes to create viable plant communities. 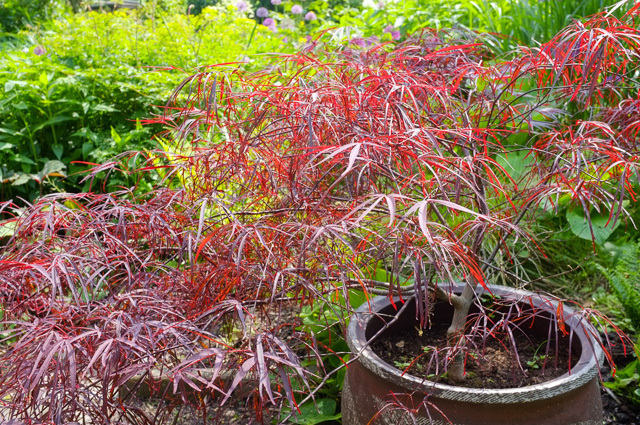 It is in late spring, just after the tulips have ended, that I become delighted by the many flowering shrubs and distinctive foliage colours that seem to dominate the garden. Of course there are various perennials flowering including Euphorbia, Geum, Geranium and bulbous plants such as Camassia and ornamental onions, but foliage colours and the flowering mounds of Viburnum and Deutzia shrubs attract all the attention. 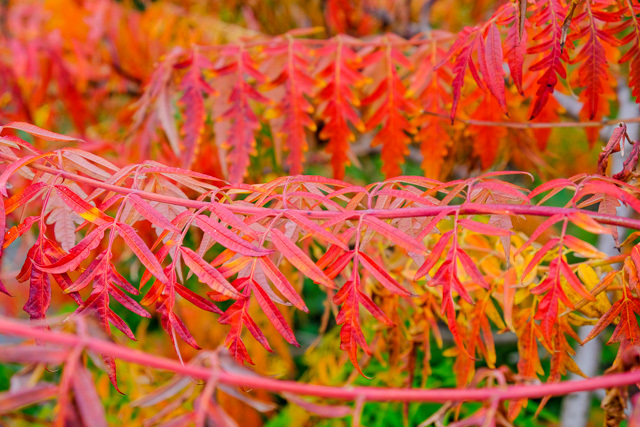 My philosophy over shrubs concludes that shrubs are best used in gardens to create highlights and structure amidst a wider field of flowering perennials and ornamental grasses. 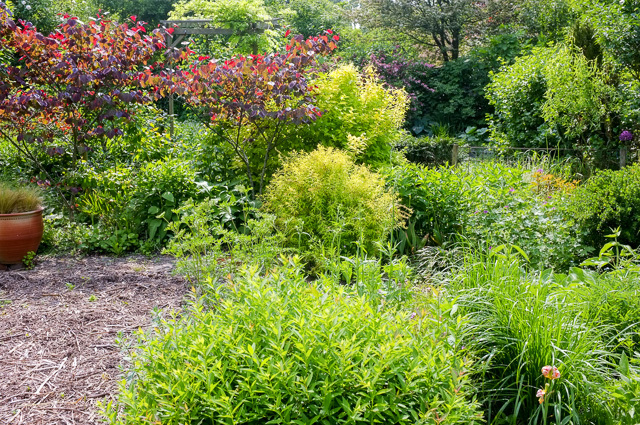 Even in my own garden where I trial many different plants, including lots of shrubs, the idea is evident, but ideally the relationship between shrubs and perennials should be far more pronounced. Many Deutzias grow too large for smaller gardens but I have found Deutzia rosea ‘Campanulata’ with D. x elegantisima ‘Rosealind’ (behind) remain sufficiently compact for my needs. 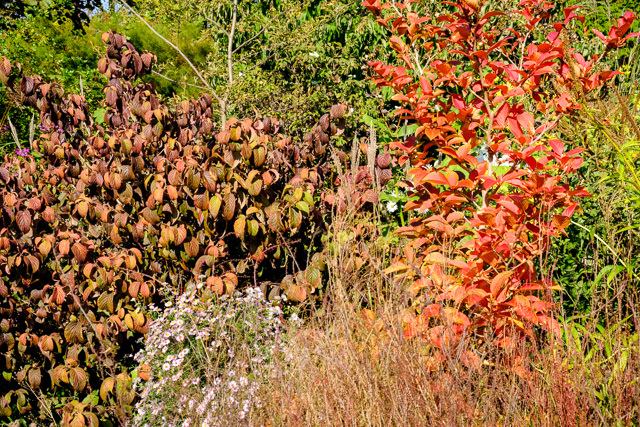 The upright shrub on the right is Frangula alnus ‘High Line’. Its distinctive upright form suggest it would work in a variety of schemes, but I find it rather boring and not very elegant, for such an upright design feature I can think of many slim growing conifers that would look so much better, and would be evergreen. Purple leaved foliage has featured in my gardens far a long time as it offers a strong, season-long contrast with the green foliage and flowers that generally dominate. Prickly Berberis, evergreen Pittosporum and Cercis with its flush of pink flowers on bare stems at the very start of the season have all proven indispensable. 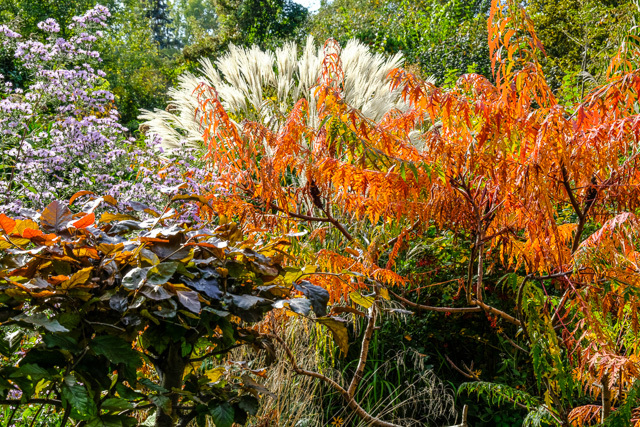 In my vision of the shrub feature border, only the most distinctive shrubs, those that have good form, foliage and flowers over a long season, are used. 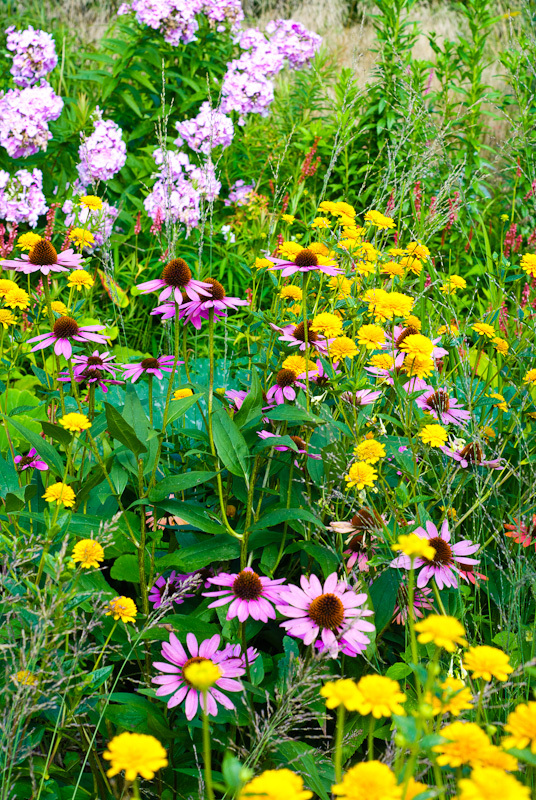 A single specimen in a small border may suffice, but often two or more examples will be scattered across the border with the intervening spaces being filled with my characteristic perennial meadow plantings. 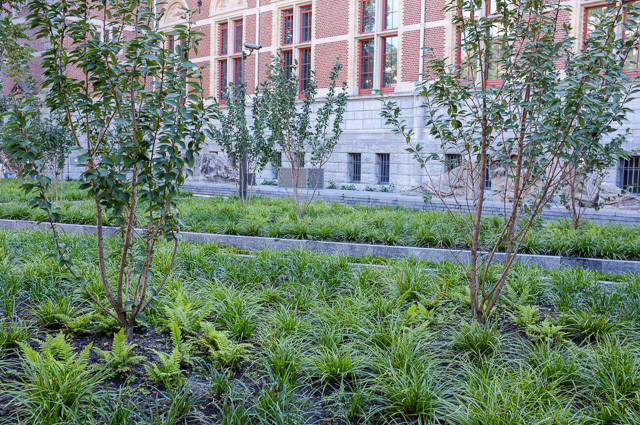 Here is a modern design by Sanne Horn for the Rijksmuseum in Amsterdam using widely spaced Prunus underplanted with Liriope, Carex and ferns. My eBook, Shrub Features, goes into the ideas behind this original approach to using shrubs in modern style gardens. 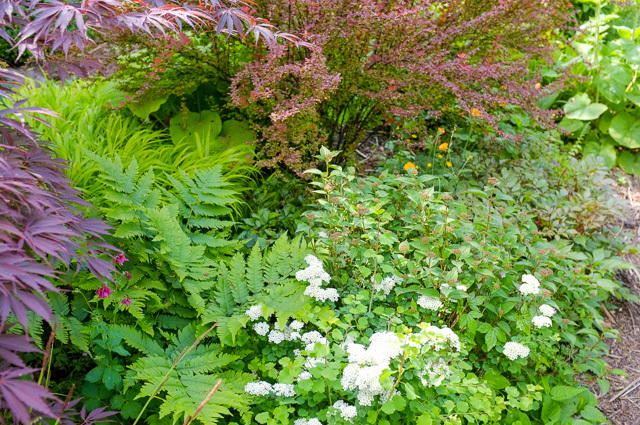 I explain how to bring shrubs and perennials together in successful border plantings as well as offering an extensive list of the very best shrubs to use in this way. Creating this eBook gave me a lot of pleasure as well as teaching me a lot about a group of plants I had not been making full use of in the past.